Try it at 13.8 volts or 138 watts. No comparison to 26.2 (24 volt systems put out 26 plus volts) at 10 amps 260 plus watts per liter. 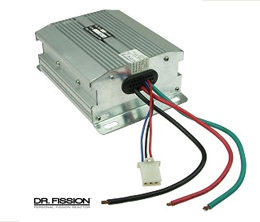 A good 24 volt system should only use around 165 watts a very few are less and more are at 178 watts per liter or much more. That would mean that 5.3 amps on a 24 volt system would make 1 liter at 138 watts. I do not think so!! 8 N in a 26 volts system is more like a heater or steam machine you need 10 or 11 N's. ONE Liter per minute per 10 amps which just isn't possible Ha Ha . We are now offering a product specifically for this purpose. By attaching a simple control to your shifter control of your system is at your fingertips. With a twist of the throttle hydrogen is produced and injected to the engine and when idling then a release of the throttle cuts the current to allow complete control and best use of your hydrogen generator.